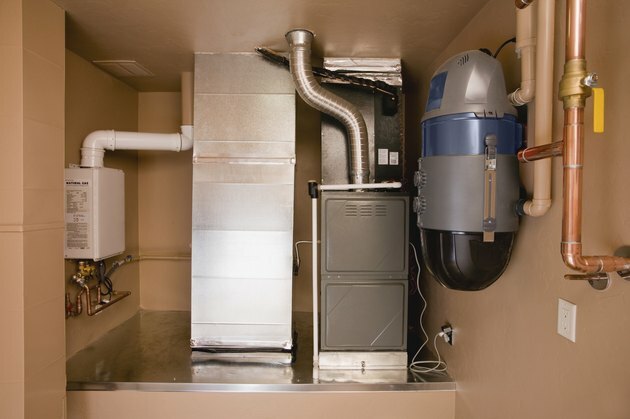 How Much Oil Should My Furnace Use in a Day? More than 8 million homes in the U.S. use heating oil. The amount these homes consume varies widely, depending on the daily outdoor temperature, home size, existing insulation, age of the furnace and other factors. While there will be no single answer to how much oil a furnace uses each day, there are ways to calculate the approximate usage. The amount of heating oil used by furnaces depends on the local temperature and home size. Heating oil replaced coal in many U.S. homes in the early to mid 20th century. Today, houses in the northeastern U.S. are the primary users of heating oil. About 8.1 million U.S. homes heat with furnaces fueled by oil, according to the U.S. Energy Information Administration (EIA). Homes that heat with fuel oil have large tanks that can hold 100 or more gallons of oil. Typically, the oil is delivered in trucks once a residential storage tank reaches about one-quarter full. In 2005, U.S. homes consumed 5.2 billion gallons of heating oil, according to the most recent national survey conducted by the EIA. In February 2009, Americans purchased 1.5 billion gallons of fuel oil per the EIA's estimations. This means that the average consumption was 186.5 gallons per household in that month. Oil use will vary each day, and furnaces will burn far more oil during the cold months of December, January and February than warmer months of the year. The best way to calculate the amount used is to note how much oil is left in the tank just before it is refilled then note how many gallons the tank needs to fill it up. When the tank again reaches the original level, divide the number of gallons used by the number of days it took to reach that point. For example, if your tank holds 120 gallons, it took 100 gallons to fill it up, and it took 50 days for your tank to return to the 20-gallon mark, you used 2 gallons a day on average. In Portland, Oregon, Priestly & Sons Heating Oil Company estimates their customers use an average of 100 gallons of oil per month in December, January and February, which is about 3 gallons per day. In fairly temperate Portland, where high temperatures range from 45 degrees Fahrenheit in January to 80 degrees in August, heating oil use averages about 300 gallons of oil for March through November. In far colder Minnesota, the owner of a 1,500-square-foot rambler house reported on the City-Data website that he used 220 gallons between December 15 and January 21. That amounted to 5.8 gallons per day. The house was kept at 68 degrees Fahrenheit. The average high temperature in Minneapolis is 25 degrees Fahrenheit in December and 20 degrees in January. How Much Oil Does a Cub Cadet Lawn Mower Take?